It has been a month since the institutional murder of Rohith Vemula at the hands of BJP, ABVP and the HCU administration. Rohith was one of the five Dalit research scholars expelled from the hostel and faced social boycott for raising his voice against injustice perpetrated by the fascist and brahmanical forces in the country. 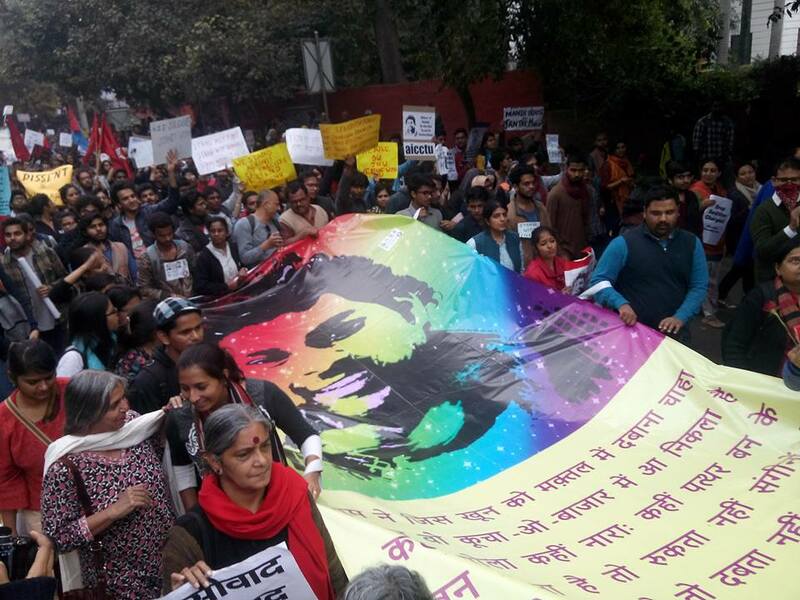 Rohith’s death sparked off hundreds of protests across the country in which people demanded justice for Rohith and end to caste discrimination in all spheres of life. But, far from justice, those who abetted the death of Rohith have received promotions to honorary positions, shielded from judicial scrutiny and defended beyond logic while the identity of Rohith and his dalitness has been questioned by these very same forces. Meanwhile, the ruling government has taken it upon itself to divert the attention of the people towards another institution of higher education, JNU, by declaring it ‘anti-national’ on the basis of fabricated intelligence reports, sensationalized news coverage and blatant conspiracy by the RSS led BJP and ABVP. The nexus of the sangh girohs in its agenda to establish a fascist rule is unfolding before our eyes in our country. In this hostile climate, we need to unite, expose the brahmanical Hindutva agenda and fight this fascist assault on the people of this country. The Joint Action Committee for Social Justice has stood for the right of every voice like that of Rohith that this government has tried to silence. We have united to demand justice for hundreds of Rohith Vemulas! We appeal to all people to join the struggle in Delhi. We, the students, workers, cultural activists, intellectuals, will rally in memory of Rohith’s martyrdom, to fight for justice and freedom and to realize the country of our dreams. Enact “Rohith Act” against the caste discrimination in education spaces. Punish the culprits (Smriti Irani, Bandaru Dattatrya, Appa Rao, Ramchandra Rao, Alok Pandey and Susheel Kumar). Remove Appa Rao from post of Vice Chancellor. Employ a family member of Rohith in the university. Pay a minimum compensation of 50 lakhs. Drop the false police cases against the five research scholars. - Appoint a special public prosecutor in the concerned case of Rohith. Constitute a judicial inquiry (non-MHRD members) into all cases of discrimination and harassment of Dalit, Adivasi, OBC, Religious Minority students in all higher educational institutions. Implement Affirmative action policies in all higher education institutions, irrespective of the management of the colleges.